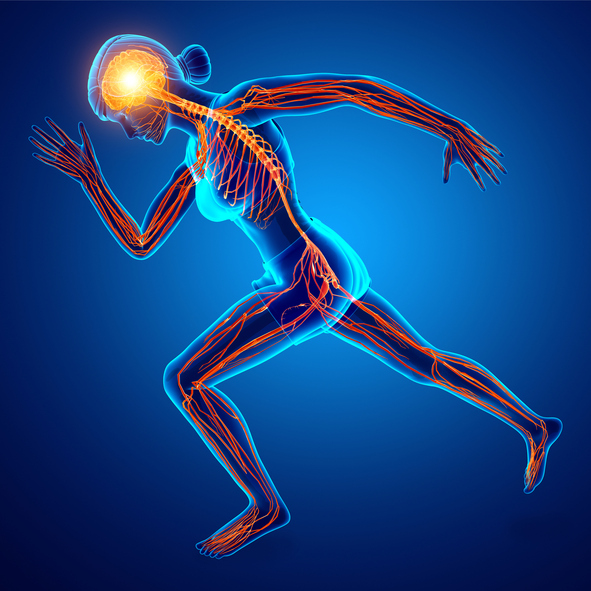 Scientists had already known that the brains of people who exercise are different from those who are sedentary, but now they are beginning to understand some of the mechanisms that make exercise so valuable. One of those mechanisms is BDNF. BDNF, short for Brain-Derived Neurotrophic Factor, is a protein that promotes new neuron growth and increases overall cognitive function. Known as “Miracle Grow” for the brain, BDNF also strengthens the synapses that connect neurons, allowing the brain to perform better. Other than fueling the brain, BDNF can act as an appetite suppressor and a natural antidepressant, helping you to lose weight and improve mental health! High levels of BDNF have also been found to fight cognitive decline, depression, and diseases like Parkinsons and Alzheimers while low levels of BDNF are linked to accelerated aging, obesity, and mental disorders like schizophrenia. So How Do I Increase BDNF? Any type of exercise is beneficial for the brain, but high intensity exercise is the most effective way to boost your BDNF levels! More specifically, consistent interval training with exercises that build coordination and agility, like kettlebell circuits, are the best. In addition to improving your motor skills, these workouts are fun and keep you from losing interest in your fitness routine! Research has shown that high levels of refined sugars and saturated fats in the Standard American Diet (SAD) can actually create structural changes in the brain that affect BDNF production. Why not try the Paleo diet? It removes refined sugar from your diet and replaces unhealthy fats with healthy fats from foods such as avocado, olive oil and grass-fed meats. For more information on the Paleo diet, click HERE. Another way to increase your BDNF is through Intermittent Fasting (IF). IF has been shown to improve cognitive functioning, cardiovascular health and regulation of your glucose levels! To learn more about IF, check out our recent blog post HERE. Getting sufficient sleep is one of the most important things you can do for your health – those who sleep well have elevated levels of BDNF and benefit from the antidepressant effects. Studies have shown that people with chronic sleep deprivation and insomnia have lower levels of BDNF. Wondering how to improve your sleep? Read more about sleep hygiene in our recent blog post HERE! Social interaction not only stimulates the brain to produce BDNF, it’s also is a great way to maintain a healthy lifestyle! And when you’re connecting with others, through exercise, you are more likely to stick with your workout routine. Why not hire a personal trainer or join a small group training class to maintain those regular social interactions? 5. Sunlight – Get Outside! Everyone can benefit from a little fresh air and sunshine! Getting enough natural sunlight is a great way to increase BDNF in the brain. An even better idea would be to invite a friend and supplement your high intensity training with a walk through town or a hike in the hills! If you would like to learn more about the kettlebell training programs we offer at Fitness Transform, request a FREE consultation today!